Take a big leap forward. The fastest Internet speeds are here, with Gigabit Internet available now in Portales. Order services now. Enjoy the big city speeds you want with the small town care you deserve by upgrading to Gigabit Internet by Yucca Telecom. With Gigabit, you’ll enjoy speeds up to 1 Gigabit – that’s 1,000 Mbps, which is 100 times faster than the national average. Gigabit Internet brings the Internet revolution to your front door, as you say goodbye to buffering and slow downloads for good. With Gig speeds, you have access to the most secure and reliable broadband connection available. 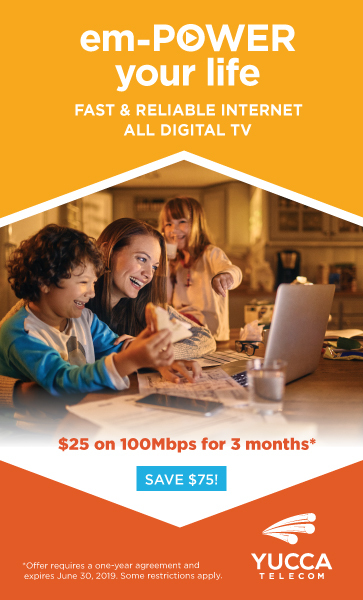 No matter how you use the Internet – streaming video, gaming, downloading and uploading large files, video chatting and more – you’ll have a seamless experience with Gigabit Internet. Also, with Gigabit Internet, you never have to worry whether you can share your Internet connection across multiple devices. In Gig City, everyone can use their Internet-enabled device at the same time! Computers, smart phones, tablets, smart TV’s, security systems, home thermostats and anything else that might use an Internet connection will run seamlessly – and simultaneously – with Gigabit Internet from Yucca Telecom. CLICK HERE and let us know you are interested in 1 GIG Internet Service! As a Certified Gig-Capable Provider, Yucca Telecom joins a national campaign spearheaded by the Rural Broadband Association to build awareness and industry recognition of community-based telecom providers that have built communications networks capable of delivering internet speeds of up to 1 gigabit per second, which is 100 times faster than those currently available in most U. S. households. “I applaud Yucca Telecom for its commitment to delivering the Internet’s fastest speeds – an accomplishment worthy of much praise considering the unique and challenging circumstances small, community-based telecommunications providers operate under every day in serving some of our country’s most rural and remote communities,” said NTCA Chief Executive Officer Shirley Bloomfield.